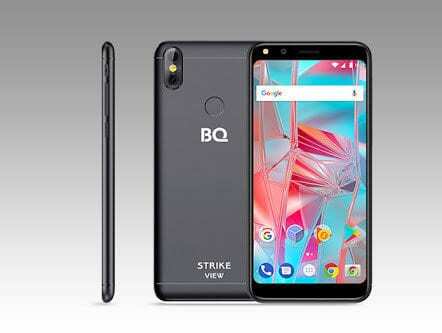 BQ Mobile BQ-5301 Strike View has been introduced by the company to the much saturated budget market. Going with the current trend, BQ Mobile made sure the device looks like Apple’s iPhone X. Although it doesn’t come with the notch but the dual camera placement at the rear gave us a clue of what the company was trying to achieve. Apart from the dual rear shooters and bezel-less display, it has 1GB RAM, 8GB Storage and retails for a token. 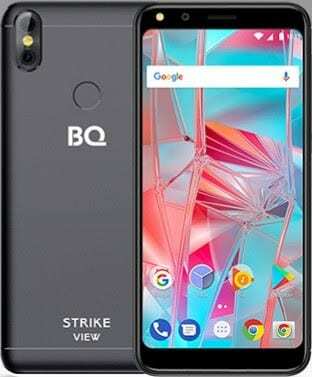 What is BQ Mobile BQ-5301 Strike View Price and Availability Status? A combination of Metal and Plastic makes up this sleek looking smartphone. I have to give it to BQ Mobile though in terms of design, they really did amazingly well with this. Sporting dual antenna lines with the iPhone X-like dual shooters. Unlike most budget smartphones, the Strike View comes with a rear fingerprint scanner, which the company claim unlocks in 0.1s. Turning over to the sides, it measures 8.65mm in thickness, the back cover is also removable to change SIMs or battery. It weighs 145g and available in Black, Gold and Rose-gold colors. Budget smartphones are now coming with the trending Full View display, you don’t need to spend much to own a bezel-less smartphone these days. The Strike View sports super minimal top and bottom bezel with extremely narrow bezels. Apart from dishing out an 18:9 aspect ratio, the 5.34-inch HD IPS capacitive touchscreen boasts of just 480 x 960 pixels in resolution and 201 pixel per inch density. Even though the screen quality is nothing to write home about, you get to experience the bezel-less screen which stretches up to 72.09% screen to body ratio. Running the race is the MediaTek MT6580M chip with Quad-core processor and 64-bit CPU architecture. The 4-Cores of processor here reaches a standard speed of 1.3GHz with 28nm process technology. While the ARM Mali-400 MP2 graphics processor handles graphics and clocks at 416MHz. For multitasking, just 1GB RAM space is available here with a memory speed of 640MHz for a smooth ride. There’s a standard 8GB storage space ready to accommodate your files including apps. You can expand the storage space up to 32GB with a memory card. The BQ Mobile BQ-5301 Strike View runs on Android 7.0 Nougat operating system. The 8MP rear camera here comes with a LED flash and other features capturing photographs with 3264 x 2448 pixels. Enjoy features like Continuous shooting, Autofocus, Digital zoom, HDR, Panorama, Face detection, Touch focus, ISO settings, White balance settings, Self-timer, Exposure compensation, Scene mode and others. Then for taking selfies, there’s a 5MP shooter at the top bezel with a LED flash as well. Powering the BQ Mobile BQ-5301 Strike View is a 2000mAh removable Li-Ion battery with no fast charging technology. Without the fast charging feature, it might take up to 2 hours to fully charge up the battery from 0% to 100%. The BQ Mobile BQ-5301 Strike View is available on Shopping stores from $79 (N25,000) to $99 (N35,000). Click on the links above to view the latest BQ Mobile BQ-5301 Strike View price & availability on Shopping stores.